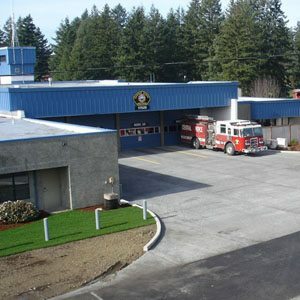 The Central Pierce Fire Station was in the need for a new driveway approach for three apparatus bays and a turn out access. They were also in need of more parking and the project more than doubled their available parking spaces. However, they had an issue with the costs of a storm system or pond area. The solution for this problem was pervious concrete. This pavement technology creates more efficient land use by eliminating the need for retention ponds, swales, and other stormwater management devices. In doing so, pervious concrete has the ability to lower overall project costs on a first-cost basis. By capturing stormwater and allowing it to seep into the ground, porous concrete is instrumental in recharging groundwater, reducing stormwater runoff, and meeting U.S. Environmental Protection Agency (EPA) stormwater regulations. In fact, the use of pervious concrete is among the Best Management Practices (BMPs) recommended by the EPA– and by other agencies and geotechnical engineers across the country– for the management of stormwater runoff on a regional and local basis. Durability was another major concern at the fire station. They have many large and heavy vehicles that are in and out of the driveway daily. Ready mix pervious concrete was the choice to improve the lifecycle of the project. Typically ready mix pavement will last up to fifty years before it is considered for replacement. Asphalt and other products however would need replaced at least five times in that fifty year time frame. By choosing a concrete parking area, you are selecting a more durable paving material that will require much less maintenance over the course of its lifetime, a considerably longer life than alternative pavements. Through its strength, durability, custom appearance, green benefits, and ease of construction, concrete parking lots and pavements are the best choice for optimal value. After placement, pervious concrete has a textured surface which many find aesthetically pleasing and which has been compared to a Rice Krispies® treat. Its low mortar content and little (or no) fine aggregate content yield a mixture with a very low slump, and with a stiffer consistency than most conventional concrete mixtures. In spite of the high voids content, properly placed pervious concrete pavements can achieve strengths in excess of 3000 psi (20.5 MPa) and flexural strengths of more than 500 psi (3.5 MPa). Pervious concrete was a sustainable solution and was compatible with the environment for the fire station because; it eliminates run off of untreated storm water, directly recharges groundwater, mitigates first flush pollution, protects streams, watersheds and ecosystems, mimics the drainage and filtration of natural soils and bioswales, provides drip line irrigation for urban trees and landscaping, reduces surface temperatures, and eliminates the need for expensive collection and detention ponds.